The Frugal Family Life: $1/2 Philadelphia Products Coupon = $.39 at Homeland!! $1/2 Philadelphia Products Coupon = $.39 at Homeland!! 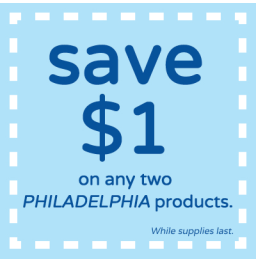 It's been awhile since we've had a Philadelphia Cream Cheese coupon, but here's a great one! Head over HERE and sign-up for an account (or log-in if you already have one) and you'll be able to print a $1/2 Philadelphia Cream Cheese Coupon! I just signed up and received my email including the coupon link within seconds! This is perfect timing for Homeland shoppers as the Philadelphia Cream Cheese is included in the "Buy 5 Receive $5 Discount Promotion!" After coupon and checkout discount, you'll be able to get 2 packages of cream cheese for only $.39 each!! Awesome price! !